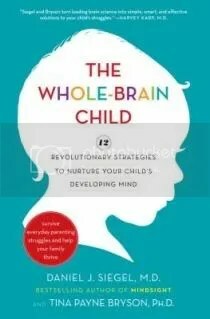 Posted on March 20, 2012	by Katy K.
This current book showcases the most recent research into how brains work and how to harness that knowledge in raising healthy, well-balanced kids. Just what everyone wants, right? And because Siegel and Bryson know that we are all busy parents, they reassure us that their helpful techniques are perfect for using in the stressful, hectic times of life, not just in those imaginary peaceful conversations rocking on the porch swing. They also include frequent cartoons, some for parents, similar to those in “How to Talk So Kids Will Listen…” and some for kids to help them understand how the brain works. There are also summary pages by age at the back which they encourage photocopying. Many of their techniques are about integrating the various functions of the brain, and they have advice for parents with their own feelings as well as for helping kids with theirs. The rational left brain and the emotional right brain need to be connected to keep emotions from overwhelming or the rational side from making decisions that the “heart” or right brain can’t go along with – but mostly with kids it’s teaching them to surf the waves of emotion rather than being swept away. “Name it to tame it” is the slogan here. Next, there’s the upstairs and downstairs brains, or the ego and the id. The civilized upstairs brain is underdeveloped in kids, and it’s very easy for the animal brain to take over. So here, it’s important to “engage not enrage” and try as a parent to keep that animal brain from setting off. Talking through ethical dilemmas in less fraught moments can help develop the upper brain, while encouraging big movement – running, bike riding, jumping jacks, etc. – when the lower brain is clearly in control can help reset things. It can be easy for kids to develop phobias they don’t even know are there based on memories of traumatic events that don’t get worked through. The authors recommend talking through potentially traumatic events right away, including how things (hopefully, say I) turned out OK in the end, to try to avoid this. If you find that a phobia has developed, talking it through giving them an imaginary remote control to fast forward past bits that are too scary initially can help work up to talking through the whole event. This seems to me somewhat counter to what I read in the research on grief in The Other Side of Sadness, although that is saying that talking through if you’re already getting better on your own can just make things worse again. So maybe it’s a talk if things look like they are getting bad. Next, they talk about integrating the whole self – visualizing the self as a wheel with a hub and feelings and thoughts as things on the rim of the wheel. It’s easy to get stuck on the rim and feel like that’s the only thing there, but important to remember that there are other possibilities. Also, they remind us, humans are social beings, meant to be part of communities. Empathy and thinking of oneself as part of a “we” is essential to being a healthy human being. They encourage regular family fun to build that sense of family belonging as well as teaching kids to consider the other person’s point of view when arguing. Overall, this is a solid book. It’s not one that I’d see being the only parenting book, and while the approach is different, the actual techniques are similar to those covered in older books such as the aforementioned How to Talk So Kids Will Listen… or Becoming the Parent You Want to Be. I have had mixed success with the techniques I’ve tried so far. When the 2.5-year old starts crying because she realizes that she almost got hurt, talking through the event has helped her calm down much more quickly. But trying to explain the wheel to the 7-year-old when he’s already upset, or anything obvious like trying to make him move, has gone over like a lead balloon. He’s upset for a good reason, and he doesn’t want anybody trying to change those feelings. (Distraction, which they do mention, seems to work better.) I never did quite get around to reading the cartoons to him at a calm moment before I had to return the book. Still, some very good thoughts and an easily-absorbed layout make this a fine choice for helping to balance your parenting techniques if you’re feeling stuck or just interested in the latest research. It seems to be getting quite a bit of good press, too, judging by the number of people waiting for it at my library.